Art Deco on the Plains. Cruise U.S. Highway 83 south out of Ochiltree County and you come to the town of Shamrock, an unlikely name for a High Plains town that bears little resemblance to the Emerald Isle. George Nickel, an Irish immigrant who grazed sheep on the area's immense grasslands where the buffalo had recently roamed, named the town when he opened a post office at his dugout six miles north of the present town in 1890. He named it Shamrock in honor of his mother, who taught him to honor the Irish folk tradition of the shamrock as a symbol of good luck and courage. Of courage, Nickel no doubt had plenty - it took guts to move into a dugout out in this rough expanse off country - but Shamrock failed to bring him any luck of the good variety. A fire destroyed his home on the range the same year he named the post office. The town didn't really get a foothold until the Chicago, Rock Island and Gulf Railway laid tracks through the area in 1902. Shamrock incorporated in 1911, and in 1923 ran a water line from the J.M. Porter Ranch, eliminating the need to haul water to town in barrels. The city's population swelled to 2,500. Today, the water tower in Shamrock rises 181 feet in the air and might be the tallest water tower in Texas, just as town boosters have claimed for decades. The discovery of oil in 1926 led to a fair-sized boom followed by an inevitable - but survivable - decline. The town was holding its own when Route 66 cut through the center of town and gave the town not so much a facelift as major reconstructive surgery. The enduring image from the makeover is the Conoco Tower at the intersection of the former Route 66 and Highway 83, a juncture once known as "America's Crossroads." The Texas Historical Commission has deemed the Conoco Tower to be "one of the most impressive examples" of art deco architecture in the country. The story goes that Nunn drew the building's design in the dirt with a rusty nail, and in 1936 J.M. Tindall and R.C. Lewis built it at a cost of $23,000. People from all over the country, usually on their way to somewhere else, marveled at a structure that writer Bryan Woolley once noted "could have stood in Oz." 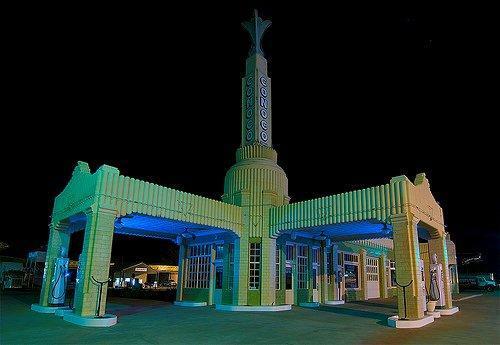 Architect Joe Berry designed it as three buildings in one: the Tower Conoco Station, named for the four-sided obelisk rising from a flat roof and topped by a metal tulip; the U-Drop Inn Caf�, which a local schoolboy named by winning a naming contest; and a retail store. The caf� was so popular that the proposed store never materialized, utilized instead to seat more hungry customers. 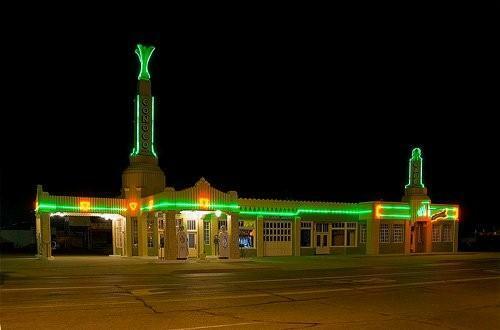 In its heyday, the U-Drop-Inn was the only restaurant within 100 miles, small, vibrant art deco oasis on Route 66 set against a backdrop of unrelenting realism. "The newcomer to this region is impressed with the almost limitless emptiness of the countryside," Jack Rittenhouse wrote in the first Route 66 guidebook, published in 1946. 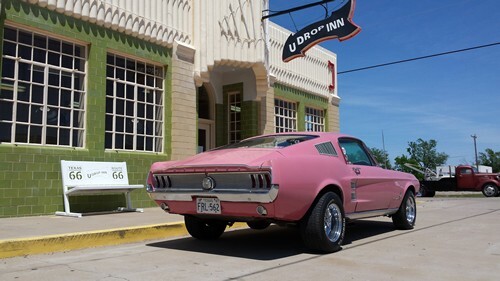 The Shamrock newspaper described the U-Drop Inn as "the most up-to-date edifice of its kind on U.S. Highway 66 between Oklahoma City and Amarillo" and the restaurant as "the swankiest of the swank eating places." Most of the old gas stations, tourist courts and other buildings spawned by Route 66 disappeared when the highway department finished IH-40 and later decommissioned the highway once known as the Mother Road. The Conoco Tower, a.k.a. U-Drop Inn, survives but it was a close call. Following its heyday, the building passed through a succession of owners, becoming Nunn's Caf� and the Tower Caf� before going back to U-Drop Inn. The bank eventually ended up with it and the once iconic building existed for a time not so much as an eyesore but as a forlorn reminder of swankier times. In May of 1999, the First National Bank of Shamrock bought the Conoco Tower - and gave it to the city. Today, it houses the Shamrock Chamber of Commerce, a museum and a visitor's center where you can buy snacks and souvenirs, recharge your Tesla out back and wonder, "Didn't I see this building in the movie 'Cars.'" Yes, you did. Pixar animators used it as the model for Ramona's Body Shop in the movie.